A man on a motorbike drove up to a crowd watching a wrestling match in an Afghan border town Monday, killing 20 people and wounding at least 30 others, the deadliest in a recent spate of attacks. The attack came hours after a bomb hit a convoy of Afghan army trucks loaded with troops in the southern city of Kandahar, killing four people and wounding 16. The man on the motorbike detonated explosives strapped to his body near a crowd of about 100 people watching a wrestling match at a fair in Spinboldak, a key crossing point into southern Pakistan, said Kandahar provincial Gov. Asadullah Khalid. "The wrestling match was about to end when the explosion occurred," Khalid said. He said that 20 people were killed, as well as the attacker, and more than 20 were wounded, at least five seriously. However, Rafiq Tarin, a government administrator in the neighboring Pakistani town of Chaman, said more than 30 people who were injured in the explosion were treated in a hospital there, including many in critical condition. It was third bombing in Kandahar province, a former Taliban stronghold, in the past two days, and the bloodiest in a series of about 25 suicide attacks across the country in the past four months. Defense Ministry spokesman Gen. Mohammed Zahir Azimi said the attack on the Afghan army convoy was a suicide car bombing. However, the army commander in Kandahar, Maj. Gen. Rehmatullah Raufi, said it was a roadside bomb. The open-backed trucks were returning to Kandahar, about 50 miles northwest of Spinboldak, from an operation outside the city when they were hit by the blast near a crowded market, both officials said. 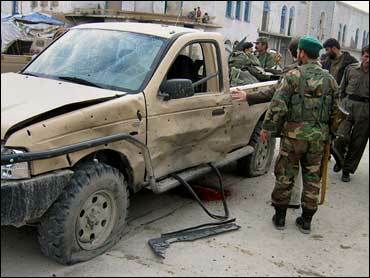 One soldier and three passers-by were killed, while six troops and 10 civilians were wounded, Raufi said. Azimi initially reported three soldiers had been killed, but later said he had been mistaken. A witness, Abdul Khan, said the bomb appeared to have been hidden in a roadside cart loaded with fruit. "One of the trucks was totally destroyed. The soldiers were thrown from the back and it hit so many people standing on the street," he said. On Sunday, a suicide car bomb in Kandahar killed a senior Canadian diplomat and two Afghan civilians and wounded three Canadian troops — part of a new NATO-led deployment in the volatile south of Afghanistan. Suicide attacks are a relatively new tactic for militants here and one that has reinforced fears that this country may see more assaults modeled on those in Iraq. Afghan President Hamid Karzai on Monday urged nations not to turn their back on his country four years after the ouster of the radical Taliban, warning it could again be used as a staging post for terrorists to attack Europe and America. Speaking at his palace in Kabul ahead of a foreign donors' conference in London later this month, Karzai said his nation will need assistance for a long time. "We are in a joint struggle against terrorism, for us and for the international community," he told reporters. "If you don't defend yourself here, you will have to defend yourself back home, in European capitals and Americans' capitals." "It will take many, many more years before we can defend ourselves with our own means, before we can feed ourselves or work for our development with our own means," Karzai added. Also Monday, U.S. military spokesman Col. James Yonts said U.S.-led coalition and Afghan forces had killed five suspected militants late Friday in eastern Khost province. He did not give further details. Asked at a news conference about the recent spate of bombings, Yonts said militant tactics had recently shifted away from direct assaults on military forces and toward guerrilla-style attacks against less-protected targets. "The enemy knows he cannot defeat us militarily," he said. "He is shifting his tactics to soft targets. He will strike without warning and he will strike, as we have seen, unfortunately against civilians." Violence across southern and eastern Afghanistan spiked last year, leaving about 1,600 people dead, the most since U.S.-led forces ousted the Taliban in 2001 for hosting Osama bin Laden, even as it take steps toward democracy. Karzai said he received an intelligence report four months ago that suicide attackers were being trained "near the borders of Afghanistan." He said many were drug addicts who were being duped into killing themselves. He cited significant political developments, landmark presidential elections in 2004 and parliamentary ones last September, but cautioned that these were motivating militants to step up attacks. "We have succeeded, massively, and that political success is perhaps one of the reasons why we are so much under attack now," he said. "Therefore the success of Afghanistan should not mean a reduction of attention, but more attention."